← Class Opener – Day 39 – It’s a Heat (Map) Wave! It’s Halloween – it’s also close to election day – let’s combine these events into one big super-terrific class opener! 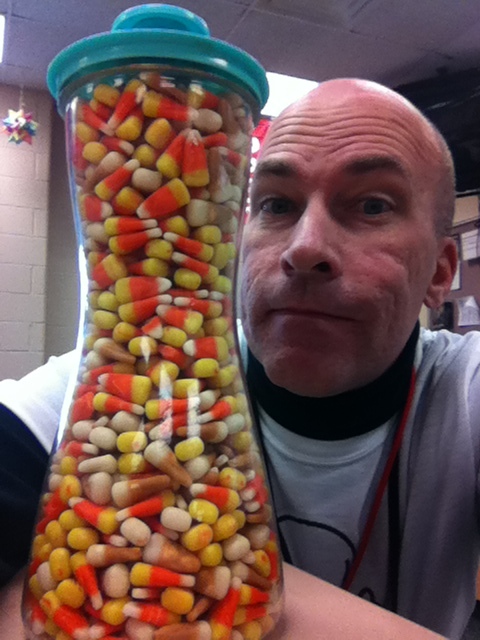 I spent last night at Wegman’s assembling my candy corn population, which consists of lots of “regular” candy corn, and some apple-flavored candy. Walking through the aisles as students got out their calculators and homework, of course they all wanted to know if the candy was destined for their bellies, or just another statistical tease. But we can do both! As the class worked through their entrance ticket, the bucket passed through the room, with instructions to pour 20 candies from the spout – without looking or choosing deliberately. 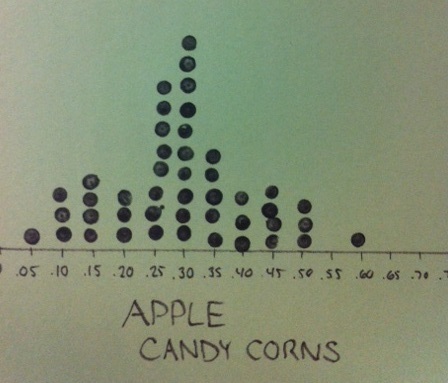 Our task: to estimate the proportion of candy corns which are apple. After our warm-up, students then approached our class dotplot and contributed their result. A discussion of how this drawing on candies is similar / different that what happens in polling scnearios followed, and I have planted lots of seeds for margin of error, which we will study formally next week.